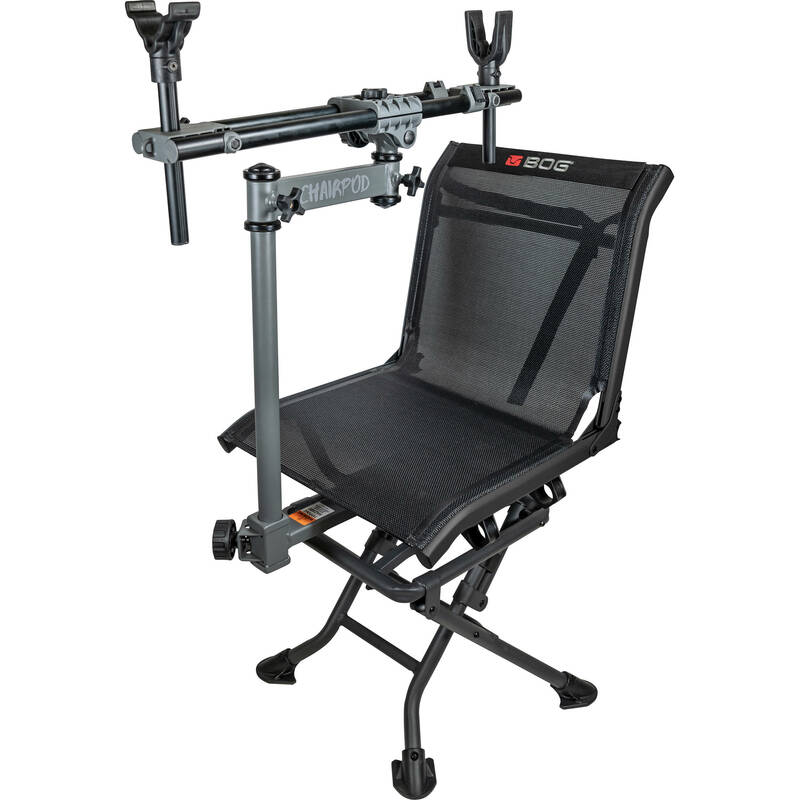 With the BOGgear ChairPod Field Shooting Rest, you can enjoy true bench-rest accuracy in one highly portable unit, eliminating the need to carry both a chair and rest with you into the field. It fully supports the front and rear of your rifle, shotgun, or crossbow for absolute stability when you're in your ground blind or hunting from a field edge. Made of lightweight aluminum and weighing around 22 pounds (10kg) the entire unit—the seat, built-in post, and swing rest assembly—collapses almost flat to be worn on the back utilizing the included backpack straps for easy transport. A roller bearing assembly allows the seat to swivel a full 360° with little to no noise, so you won't spook or scare game. The fully adjustable dual tube-style rest can be set for rifles or crossbows of various lengths to get the most comfortable shooting position, and the support forks can moved up and down for further shooting stance comfort and are made of non-marking or marring molded rubber. The rest height can be set up to 40" (1m) to accommodate most shooters, and the up/down tilt is tension adjustable so you can make precise corrections to your position for improved accuracy. The ChairPod not only improves your long-distance accuracy, it also supports your rifle conveniently in front of you while leaving both of your hands free to use binoculars or rangefinders or simply keep them in your pockets for warmth so you can quickly react when targets present themselves out of the blue.